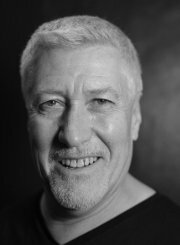 James trained at LAMDA and in a professional acting career spanning more than thirty-five years James has appeared in well over one hundred and fifty theatrical productions. James appeared in Sir Alan Ayckbourn's Olivier award winning production COMIC POTENTIAL (Stephen Joseph Theatre Scarborough/Lyric Shaftesbury Avenue), Award-winning playwright Richard Cameron's THE GLEE CLUB (Bush Theatre/Duchess Theatre Dir Mike Bradwell). BRASSED OFF (Birmingham Rep/Liverpool Playhouse), OLIVER! (Nottingham Playhouse), CINDERELLA (West Yorkshire Playhouse), ON THE PISTE (Derby Playhouse), A PASSIONATE WOMAN (Ipswich Wolsey Theatre/ Oldham Coliseum Theatre). ONE NIGHT IN NOVEMBER (Belgrade Theatre, Coventry),THE FLANNELETTES (The Kings Head Theatre. Dir Mike Bradwell). For the renowned Hull Truck Theatre Company James has appeared in several highly successful national touring productions of plays written and directed by playwright John Godber. These include 'Lucky Eric' in two productions of BOUNCERS, 'Arthur Hoyle' in two productions of UP'N'UNDER, 'Ron Marlowe' in two productions of PERFECT PITCH, 'Don' in ON A NIGHT LIKE THIS, 'Mark' in GOING DUTCH, 'Chris' in GYM AND TONIC and as 'Dave' in FLY ME TO THE MOON. James has also performed in seasons of plays at: The Steven Joseph Theatre Scarborough, The New Vic Theatre Stoke-on-Trent, Worcester Swan Theatre, Haymarket Theatre Basingstoke, Derby Playhouse, Century Theatre Keswick and, notably, Northampton's Royal Theatre, where, over the years he has appeared in many productions. These include: BLOOD BROTHERS, FAR FROM THE MADDING CROWD, MACBETH, THE SOUND OF MUSIC, SEASONS GREETINGS, OLIVER! and several highly successful pantomimes. To date, James has adapted five novels and performed them as one-man plays: OLIVER TWIST, A CHRISTMAS CAROL, GREAT EXPECTATIONS, DRACULA and DAVID COPPERFIELD.